Vacuum compression moulding presses substantially enhance the moulding quality and increase the production capacity. The high efficiency comes from vacuum chamber. Effective degassing due to the vacuum created around the mould reduces heat loss to the surrounding. 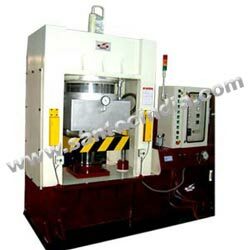 These presses are also available with die sliding and ejector arrangement and tilting of upper platen for easier access. The mould coming out before opening, making it easy for the operator to remove the finished product/reloading for the next cycle.